Efficacy of Firearms for Bear Deterrence in Alaska and Efficacy of Bear Deterrent Spray in Alaska were 2 halves of a straw man argument designed to prove bear spray was more effective than a gun. The bear spray study only included incidents when people sprayed bears; in 27% of the gun incidents, people did not have time to shoot. Just 10 of 72 bear spray incidents involved charging bears. About 60% of bear spray incidents involved agency personnel spraying habituated bears in national parks–when brown bears were sprayed, the sprayer had back-up, a colleague armed with a 12 ga. shotgun. The “methods” for the gun study said the authors analyzed “bear attacks.” When you compare the results of these 2 studies, bear spray proved far more effective than firearms. But you’ve got to be a totally unscrupulous, wildly unethical biologist to compare the results of these studies. It’s kind of like crashing a Toyota Tacoma head on into a wall at 100 mph, backing a Ford F150 into a a wall at 5 mph, and then claiming research proves Fords are safer than Toyotas. BACHELOR GULCH – The Aug. 31 shooting of a bear in Bachelor Gulch still echoes among residents in the upscale enclave.The Colorado Division of Wildlife continues to investigate the incident, in which homeowner John Tietbohl shot and wounded a bear outside his Daybreak Ridge home. Tietbohl told officers the bear had been trying to get into his home, then charged him as he was getting into his car that evening. 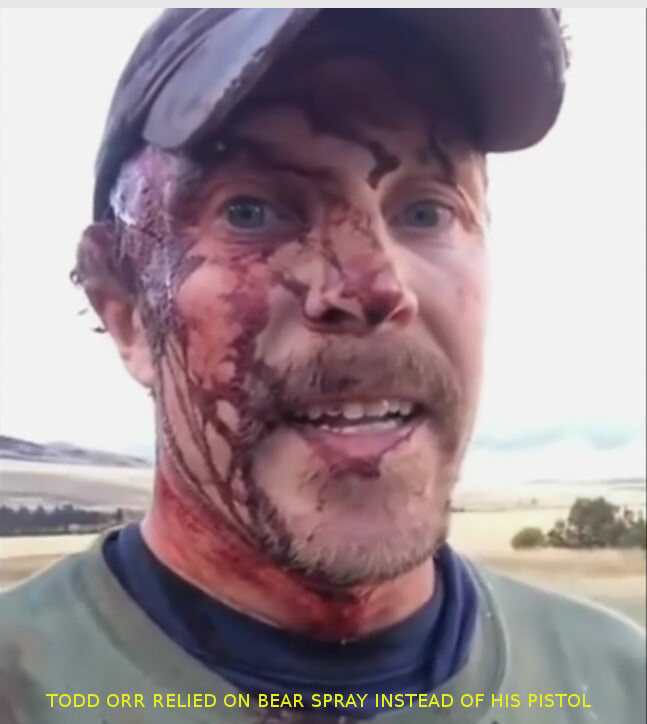 Tietbohl, who had been carrying a 9-millimeter pistol as a sidearm to protect himself from the bear, shot and hit the animal, which left a trail of blood as it ran off.Earlier in the day, Bachelor Gulch security officers had repeatedly sprayed pepper spray at the bear near Tietbohl’s house, but the animal stayed around. The bear also reportedly slipped into Tietbohl’s garage in the days before it was shot. The first pistol shot entered the bear’s body just under the chin, traveled through the sternum and clipped the aorta, Sheppard said. The second hit the bear in the chest. Both likely would have been fatal. Three bullets — one to the back and two to the head — brought down the 534-pound male practically at the hunters' feet. Murphy, he said, did not fire his .357 revolver until the charging bear – a grizzly, Holden said DNA tests later confirmed – was 7 to 10 feet away, and not until bear spray discharged when the animal was 15 to 25 feet away failed to deter it. “F***! No! Bear! No!” I screamed in terror as she started snapping her jaws and bounding towards my friends and me. Each snap sounded like an axe hitting concrete. I got behind my one friend who was armed and threw both my gun and my camera on the ground in panic after the bear spray. She was terrifying and extremely vocal, huffing and grunting. The person who had the bear spray shakily handed it to me without the safety on, ready to go. I ran to my friend’s side to spray her, but, by then, it was too late: she had already bluff charged us once and was almost on top of us. My friend fired off a round and hit her right on the top of her shoulder, but she wasn't fazed. He fired two more shots as I was spraying, but the spray wouldn't go more than 10’ and, at this moment, she was at 15’.